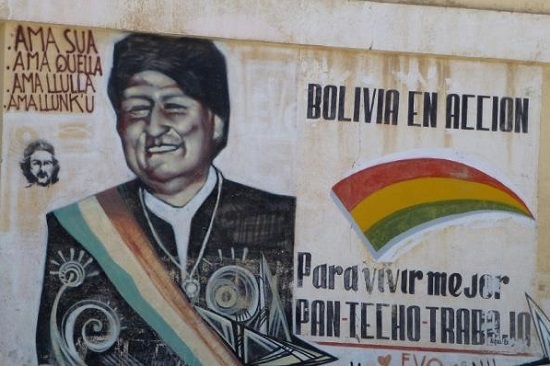 HomeArchivesBoliviaBolivia Votes: Can Evo Morales Run Again? On February 21, some 6.5 million Bolivian voters will decide whether to amend their Constitution to permit a third consecutive presidential term. A “Yes” vote will allow President Evo Morales and Vice-President Alvaro García Linera to run for reelection in 2019 for another 5 years. A “No” vote will require the ruling MAS (Movement Towards Socialism) party to select a new slate in 2019. Morales, Bolivia’s longest-serving president, has just completed his first decade in office (2005–2015)—a remarkable achievement in a country which has suffered close to 200 coups. He also has the longest tenure of any incumbent Latin American president, with a current term extending to 2020. The proposed amendment would actually allow him a fourth consecutive term— 20 years in total— counting his first (2005) election, which predates the new Constitution. Morales wants 70% of Bolivian voters to ratify the amendment—though only a plurality is required—to top the 54%, 64%. and 61% mandates he received, respectively, in the 2005, 2009, and 2014 elections. He also won a 2008 “recall” vote by a landslide (67%). Overall, Bolivians appear to be split roughly 40%/40% between the “No” and the “Yes,” with 20% still undecided—despite Morales’s continuing high approval ratings (65%). For pro-government militants like Katu Arkonada, the upcoming referendum represents the biggest challenge that Morales and the MAS have faced in the past 10 years. Mobilizing for the “Yes” vote are MAS party leaders, mayors, governors, and affiliated social movements, including peasant, labor, and indigenous sectors, with Morales and García Linera acting as head cheerleaders. “Yes” proponents argue that Morales needs an additional term to complete the work he was elected to accomplish, represented by the Patriotic Agenda 2025, an ambitious plan to reduce poverty and ensure basic services for all Bolivians through massive investment in hydrocarbons, energy, agriculture, mining, science, and technology. Morales frequently recalls that the push to extend term limits originated with the social movements, who marched through the streets of La Paz last September to hand-deliver signed petitions to the Plurinational Legislative Assembly. “Workers and social organizations will not jeopardize this ‘process of change,’ and that is why we are supporting the reelection of President Morales,” said a workers’ representative at the time. The “No” campaign, too, is more diverse than might be expected. Among its proponents/ associates are familiar opposition figures like cement magnate Samuel Doria Medina, former conservative president Jorge (“Tuto”) Quiroga, and ex-Cochabamba governor and fugitive-from-justice Manfred Reyes Villa. Joining them is a broad coalition of MAS dissidents and former MAS allies, led by La Paz Mayor Luis Revilla and La Paz Governor Félix Patzi from the new center-left Sol.bo party. This group largely represents disaffected urban middle class voters who split with Morales over the TIPNIS conflict, but also includes other disgruntled popular sectors, such as Potosí civic groups who feel shortchanged by the Morales government. This opportunistic alliance represents the first time that diverse MAS critics—ranging from vehement opponents of Morales’s political project to leftists who hope to rehabilitate a stagnating “process of change”—have attempted to unite around a common goal. For progressive “No” supporters, extending presidential term limits violates the traditional Andean concept of leadership rotation, and will only serve to perpetuate autocratic tendencies within the MAS that preclude new leadership development. Changing the rules of the game for the benefit of incumbents, they note, could have unintended but lasting negative consequences for Bolivian democracy. Those more sympathetic to Morales, like ex-MAS prefect Rafael Puente, argue that Morales himself would benefit from a political “time-out” to reconnect with his bases, in preparation for a future candidacy. In fact, while the trend in Latin America is towards unlimited presidential reelection, most countries do require incumbents to step aside for periods ranging from one term (in Chile) to 10 years (in El Salvador) before they can run again. A recent constitutional amendment in Ecuador follows this pattern, forcing the incumbent Correa to sit out the next (2017) election. Four countries (Guatemala, Paraguay, Colombia, and Mexico) limit presidents to a single term with no reelection. Only 3 countries (Venezuela, Nicaragua, and Honduras) have completely abolished term limits. As voting day approaches, the campaigns have intensified, with propaganda flooding the airwaves and social media—especially from the government side, which has not hesitated to exploit the advantages of incumbency. The Electoral Commission (TSE) has gone to some lengths to create a level playing field, especially by restricting air time for the delivery of public works. However, after a challenge by the government, this ruling was recently overturned by Bolivia’s Constitutional Court (TCP). The use of hyperbole, fear-mongering tactics, and “dirty tricks” has escalated on both sides. The Vice-President has assured Bolivians that a victory for the “No” will mean the end of the MAS project and a return of U.S.-backed neoliberal regimes. The “No” campaign, he and Morales allege, is part of a U.S.-financed strategy to undermine and topple leftist governments in Latin America (while this could be true, the evidence to date is not convincing). Moreover, Bolivians risk losing their cash transfer benefits (for elderly, pregnant women, and schoolchildren) and even their homes, if the “Yes” is defeated. For their part, proponents of the “No” charge that a victory for the “Yes” will keep Morales in office indefinitely, creating a state of virtual dictatorship. A campaign seeking to defame Morales personally through allegations of nepotism, corruption, and misspending—e.g. for an alleged $200 haircut— has gained little traction. In effect, both the “Yes” and the “No” campaigns have turned the referendum into a plebiscite on the Morales government, its 10-year record, and its future promises—more like a presidential election than a consultation on constitutional reform. This works to Morales’s advantage, given his continuing high approval ratings. In the end, the “Yes” vote will likely prevail, but by a much narrower margin than Morales has enjoyed in previous elections. Bolivians do appear to be uneasy about the implications of extending term limits for future presidents, if not the current one, and the failure of MAS party to cultivate new leadership. Still, for most voters, these concerns are largely outweighed by material satisfaction as Bolivia’s economy remains among the strongest in Latin America, powered by massive public investment. Foreign reserves, diligently built up by Morales and currently standing at 42% of GDP, are helping to cushion the blow of falling commodity prices, at least for now. 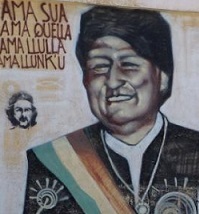 Bolivians also strongly identify with Morales’s ambitious national-popular agenda, including his signature achievements like the La Paz teleférico (cable car system), the communications satellite Túpac Katari— which has brought the internet to schools in remote villages— and the bold campaign to regain Bolivia’s seacoast from Chile. In contrast, the precariously-united “No” campaign has not presented a coherent programmatic alternative to the MAS, and is tainted by over-identification with unpopular traditional opposition politicians. For better or worse, there appears to be a strong belief by many—Bolivian capitalists as well as indigenous and peasant voters—that Morales remains essential to moving the national-popular project forward. Still, as MAS deputy Manuel Canelas has observed, a victory for the “Yes” in February far from guarantees Morales’s reelection in 2019. If people give Evo another chance, says Canelas, they will be impatient to see that pending challenges are addressed. These include reforming the judicial system, confronting institutional violence against women, and moving away from extractivism towards a more diversified, productive economy, while balancing diverse sectoral demands for improved living conditions, jobs, and services. Emily Achtenberg is an urban planner and the author of NACLA’s blog Rebel Currents, covering Latin American social movements and progressive governments.